The account Journal provides a wide information and details about all of the accounting activity of the client and allows to view and modify any of the client entries (according to authorizations). 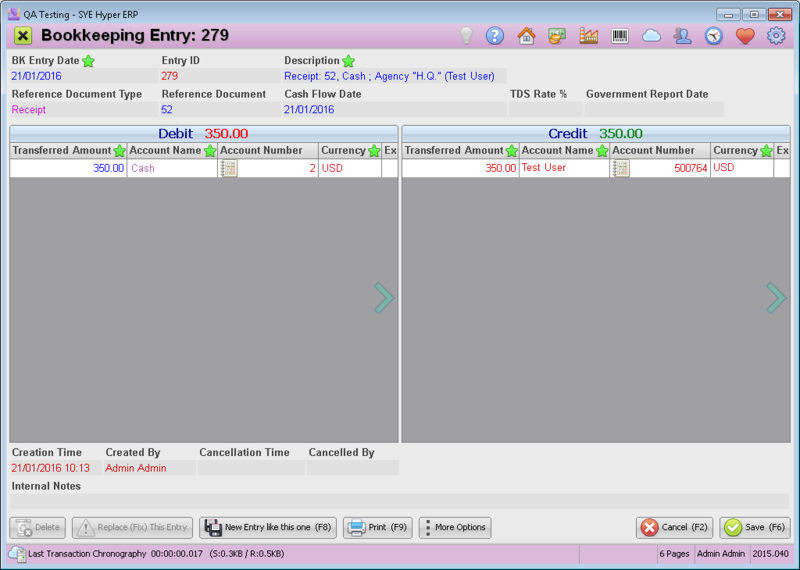 Also, the account journal is used for bundling entries, producing reports and exporting the accounting data. After displaying the required entries, the user can modify the entries, bundle entries, print and export the data. Account Number The number of the chosen account. Multi Currency Separate the entries according to the used currency. The calculated balance for each of the currencies will be displayed in the table at the bottom of this window. Print Results By Choose the required printing display from the suggested list. From / Till BK Entry Date Choose the time frame of the required bookkeeping entries. From / Till Cash Flow Date Choose the time frame of the cash flow for the required bookkeeping entries. Government Report Date Choose the report date for the government and authorities. After filling in the required fields, click the Execute Report button. No Sign - The Bookkeeping Entry was not bundled. - Partial bundle. This bundle was NOT Complete. - Bundled Bookkeeping Entry. This bundle is complete (balanced). Bookkeeping entry is balanced when the Debit value equals to the Credit value. Double click on journal entry to open it for modifications and for additional available actions related to the selected bookkeeping entry. Hide the bundled (balanced) entries that were marked with . Bundle bookkeeping entries that are unbalanced or partially balanced. This action button allows to execute advanced features that will be described below. To read this section click here. In the table at the bottom of the window, there are calculated balance fields. The calculated fields will be split according to the different currencies, if the "Multi Currency" field was defined as "YES". Export the data from this table. Choose the required file type from the list. Print the report, Save as PDF or send by Email. The printing display is according to the the definition of the "Print Results By" field. 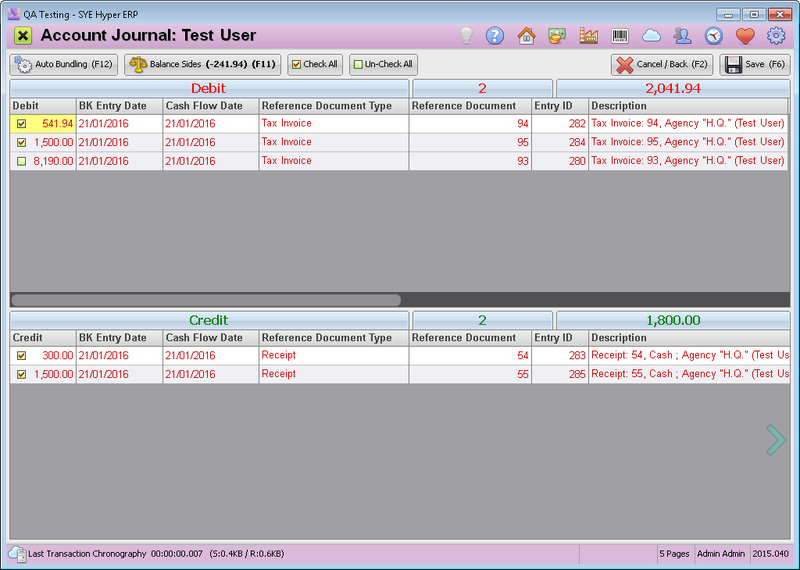 If an unbalanced bookkeeping entry is marked, the new window will display all off the unbalanced bookkeeping entries. If a partially balanced bookkeeping entry is marked, the new window will display the partially balanced bookkeeping entries as well as the unbalanced bookkeeping entries. 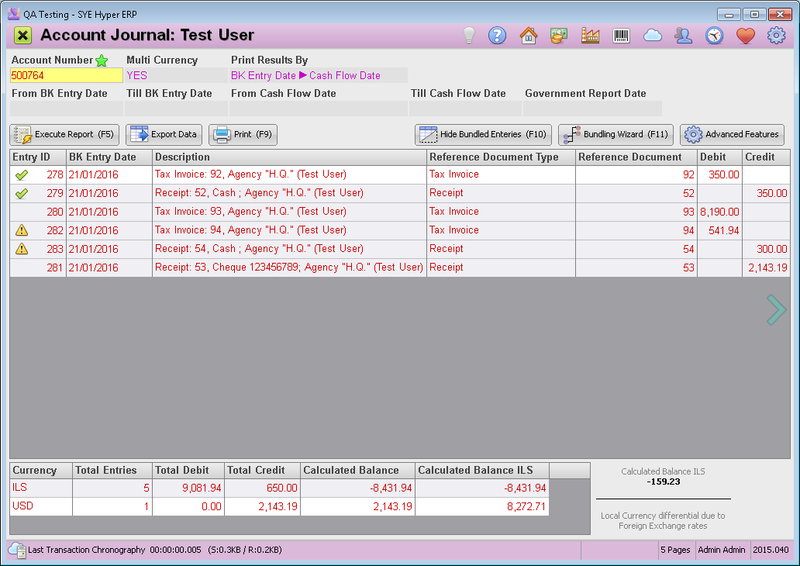 If a bundled (balanced) bookkeeping entry is marked, the new window will display the balanced bookkeeping entries only. Each of the bookkeeping entries has a check box. checking this check box will add the amount of the entry to the total sum at the top of the table. 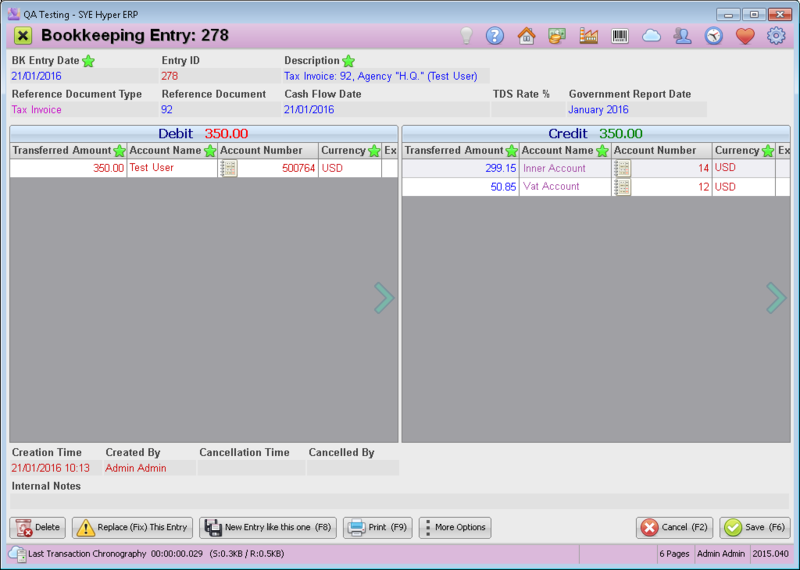 In order to bundle the chosen bookkeeping entries, mark the equal entries in the Credit and Debit tables. This can also be done by using the Auto Bundling button. By using this button, the system will try to find the bookkeeping entries in the Debit table and in the Credit table that can be bundled, according to the Cash Flow / BK Entry dates and the amount. The system will automatically mark the check boxes of the bookkeeping entries that can be bundled. In order to approve these bundling, press the Save (F6) button. When a bookkeeping entry is partially balanced, the system will ask to approve this partial bundling. These bookkeeping entries with a difference between the total sum of the Credit and the Debit will be marked with . When marking a bookkeeping entry in one of the tables that does not have any equal entry in the other table, the system will allow to manually create a new bookkeeping entry in order to balance and bundle it. By using the Balance Sides option, the user can search for a Client / Supplier / B.K. Account / Project to balance the bookkeeping entry. after choosing the required account, the user will be asked to fill in a description and BK entry date for the new bookkeeping entry that will be added to the chosen account. After marking the bookkeeping entries to bundle, press the Save (F6) button. In order to cancel the bundling before saving it, press the Cancel / Back (F2) button. Move Selected Entries to a Different Account - By using this option, the user can move the selected entries to other chosen account. In the new window, the user will need to mark the check boxes of the required bookkeeping entries. Change Government Report Date - This option is used to modify the the report date of the entry in case of wrong defined date. The government report date can be modified according to the actual date. Press the Save (F6) button to approve the modifications. Organizations that use few different currencies, need to define it in the System Fundamentals of hyper. Go to the "Bookkeeping" Tab and choose "YES" for the "Bookkeeping in Multi-Currency Mode" field. When using only one currency, we recommend to choose "NO" in the "Multi Currency" field at the top of this window.